Welcome to MV Tanglewood. Please fill out the "Follow this blog by email" (to the right) to receive notifications of updates to the blog. Thanks, and enjoy! NOTE: If you don't see the "Follow this blog by email" box to the right, try turning off Adblock for this site. For some reason it blocks that tool. I've had a couple of inquiries wanting to know more about the Maretron monitoring that I have set up, so here goes. First of all, it's still a work in progress. Phase one was focued on getting the basics and/or easy things monitored, and phase 2 (and maybe 3, 4.....) will be addition of more sensors, better alarming, and general tuning and adjusting based on experience as I actually use it more. You can read all about their product line at Maretron, so I'll just do a brief overview. 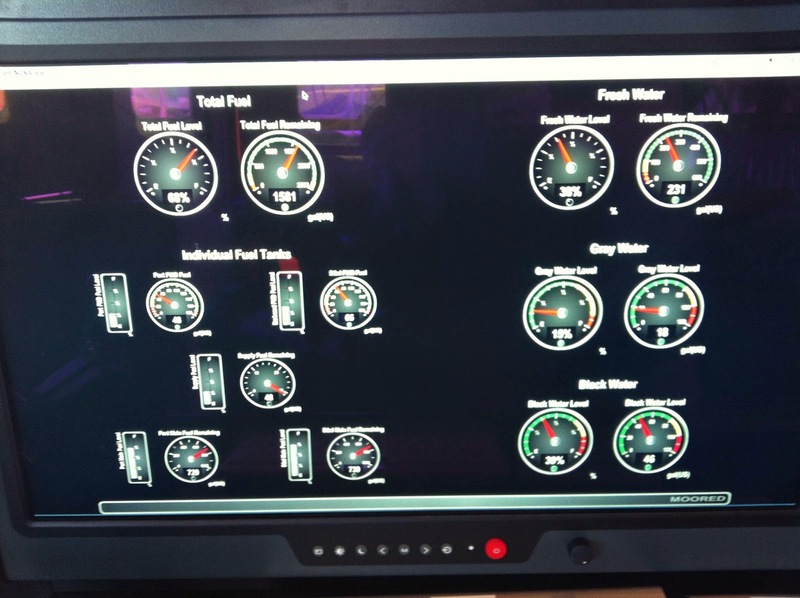 They have a full line of sensors and display products for the marine industry, all using NMEA 2000 (aka N2K) as the interconnect. Once you have an N2K bus running through your boat, it becomes real easy to add sensors for all sorts of things. Their display products range from 4" square panel displays to very flexible software that can run on a Mac or Windows. The stuff isn't cheap, but by marine standards it's not real expensive either. I'd say the bang for the buck is quite high. I had a few sensors on my Grand Banks along with two of their smallish displays (about 4"x7"), one at each helm. That's how I became familiar with the product line. On the Nordhavn, I've added a number of additional sensors, and do all the monitoring using their software product (N2KView) running on a Mac 24x7x365. N2KView is really very nice, and costs about the same as one of Maretron's mid-sized dedicated display. It comes out of the box with about 6 different screens geared towards typical use. I borrowed from a few of them, but have ended up creating my own screens. It takes time, but the results are worth it. One thing I don't like is having to flip through different screens looking for info. I much prefer to have all the pertinent info visible at the same time so anything can be checked with a glance. Being able to set up my own screens allows for that which I really like. Then I have another one called Instruments (not the best name, but that's what I called it) mostly for test purposes. The idea is that there are different sets of info that need to be monitored when underway vs at anchor. By creating a screen for each, I can fit all the important stuff and get rid of extraneous, distracting info. Note that the Tankage screen doesn't really fit this model. It's one of the first screens that I made before becoming clearer on how I want to organize things. It might become "Docked", or it might go away completely with elements merged into other screens. I just don't know at this point. What I do know is that it's the only reason we need to change screens while underway or at anchor. 2 TLM200s for black and gray water tanks. These tanks come with level sensors, but they are very course, basically telling you that it's empty, it's somewhere less than half full, it's somewhere more than half full, and OMG don't flush the toiler. I want a little more warning before the OMG event. 5 TLA100s for fuel tanks and water tank. I might also add some more run indicator sense points, and I need to add a second J2K100 to get main gear data on N2K. For an obscure reason, it doesn't come over with the engine data and requires a separate converter. N2KView is pretty good, and starting about a year ago they significantly improved their licensing so it’s more affordable. I’m still running V4.x and they are up to 5.x now. I tried 5.x, but it broke a hand full of things so I backed it out. The trouble with 4.x is that alarming pretty much doesn’t work. Or more accurately, sending email when alerts are raised/lowered doesn’t work. I’ll recheck it once I get to V5, then work the issues from there. Since I'm running an old version, I haven't even asked. I don't have a picture of the Anchored screen, but it shows the boat's location inside the allowed swing circle, plus all the same weather info that's on the Underway screen. Again, all this is a work in progress and highly subject to change. Hope this helps answer some of the questions. What makes an Experiment an Experiment? Some degree of failure is expected! That's what makes an experiment an experiment. But you also expect to gain significant improvements, making the failures worth while. My electronics system has been an experiment, exhibiting both failures and significant improvements. We continue to work through some open issues, but I though it was a good time to reflect on the success or failure of this experiment, and lessons learned. Most boats of this class are outfitted with Furuno-everything. My Grand Banks is done that way. But my experience has been that it's a bit of a dinosaur, has a lot of "quirks", and in my opinion could be a lot better. Doing it better has been the goal of the N60 electronics project. It's also important to side track a moment to reiterate that my view on products is unlikely to represent the mainstream. After a career developing electronics products, I admittedly look at them with a very critical eye. The curse of a products guy is that you are always looking for things that could be better, and to most people it comes across as complaining and nit-picking, but that's how products get better, and what makes great products great. So please feel free to dismiss all my views as a combination of complaining and nit-picking. Back to the electronics system. You can go back and read about it's evolution, but in summary I looked at a lot of different approaches, and different vendor's equipment. I played with a lot of products at trade shows, and experimented as much as I could short of having equipment installed in a boat and being out on the water. I even bought a bunch of equipment to bench test at home as part of making the final decisions. The other critical part was selecting an installer to work with. Performance Marine (Stuart Miller and co) was, and continues to be a great partner. They are highly knowledgeable and capable, able to manage installation work done at the yard in Asia, and have done excellent work to complete the installation. And most important, they totally stand behind their work and do whatever it takes to fix any issues. Plus, in my case, I needed something else. I needed an outfit that was willing and able to take the somewhat different approach that I desired, and was willing and able to work through the issues that can be expected with such a project. I needed someone who was willing and able to participate in the experiment. They have been nothing but as asset during the whole process. The "failures" we have encountered have been largely due to my equipment choices, and the solutions to those failures have been largely provided by Performance Marine. I highly recommend them for any electronics project. Although we continue to work through a handful of issues I think it's useful to reflect on some of the elements of the "experiment" to see what worked and what didn't. 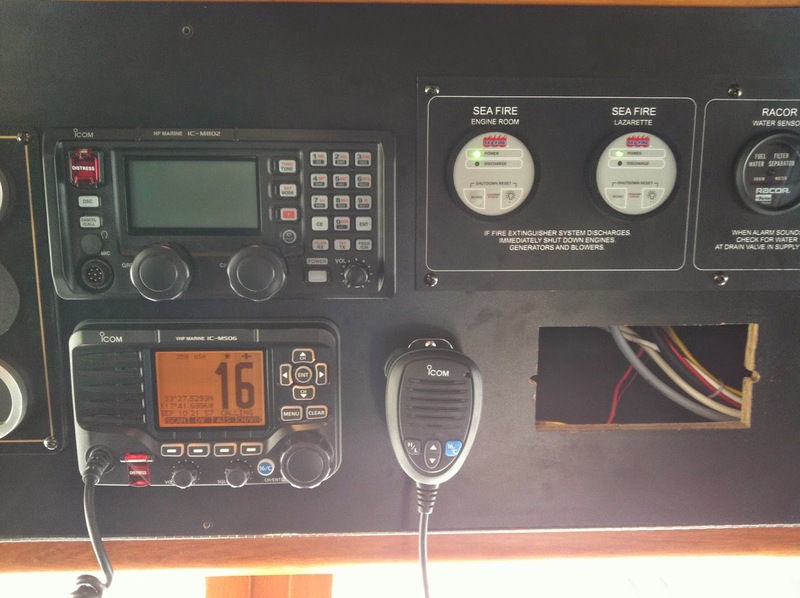 1) Use NMEA 2000 (N2K) to connect everything wherever possible, preferably everywhere. The old way of wiring everything up is using NMEA 0183 which is a point-to-point wiring system. Each set of wires has only one device that can "Talk", and everything else connected to it "Listens". So for every device that talks, you need an additional set of wires. And every device that listens needs a dedicated port for each device that it needs to listen to. In small systems this isn't a huge deal, but as a system gets larger there is a geometric growth in the number of wires and the number of ports required on devices. It becomes further complicated when you want to have redundant "talkers", like two GPSs. Physical switches are required to allow devices to select which GPS they want to listen to. It gets very ugly very fast. N2K is a single set of wires that everyone shares, devices take turns talking, and anyone can listen. It enormously simplifies wiring, and leaves a system that is understandable by anyone looking at it, unlike the wiring of an 0183 system. It furthermore simplifies the use of redundant devices by allowing any device to be told who to listen to, and to switch to a secondary either automatically or by some command or algorithm. There are no switches. Reflecting on N2K, I would do the same thing over again. But I have also found that N2K still needs some work to get where it needs to be. The basics work great, but when you start to add redundant components, it's not as mature as I'd like it to be. Some vendors take conflicting approaches to how you select which device you want to listen to. I have been able to work around most of these, but vendors keep wanting to point figures at the other guy and put me in the middle between them rather than simply call each other on the phone and figure it out. I saw the same thing during the evolution of Ethernet and the companies that became today's giants were the ones that realized the winner would be whoever worked with the most other products, regardless of who was "right". Customers buy products that work, not products that are technically "right". Anyway, it will be nice to see this part of the industry mature a little more. The other thing I have found is that there are places where you just can't get away from 0183, or perhaps more accurately, where N2K just isn't ready for prime time. AIS Class A, for example, appears to be all implemented with 0183. There are a few devices that have N2K on them, but I'm finding that is only for transmitting AIS reports to other display devices, and that it doesn't work for connecting up a heading sensor, for example. So you still need 0183. I also ran into a variety of issues with multiple AIS devices on N2K. There doesn't appear to be a consistent way (or any way) to select which one to listen to, And it doesn't appear to be clear who/where your own AIS position reports are supposed to get filtered out so displays don't think you are about to collide with yourself. Single AIS works fine, but add a second, like a VHF that also has an integrated AIS receiver, and these subtle issues start to emerge. I guess the overall lesson is that architectural purity. i.e. all N2K and no 0183, is not practical for this type of boat. - Control and display of radar, including overlay on charts so you can see the radar returns in context like which blips are buoys and which are boats. - Presumably more reliable inter operation of components since they are from the same vendor. Integrated, single vendor equipment is great when it all works, and when every piece is also best-of-breed. Vendors love it because it drives you to buy more of their equipment. They also love it because once you install it, it becomes very "sticky", meaning you are unlikely to move away from their brand because it will lose the integrated features and/or you will have to replace everything. The problem for consumers is when something important doesn't work properly, or when some key element is inferior to other brands, it's hard/painful to switch because of the "stickiness". Right now we are struggling with this with our Radar. Hopefully Simrad will sort out what's going on. The alternative is to forgo integration and focus more on selecting best-of-breed components. One lesson learned so far is that best-of-breed components is more important than integration. I'll take integration anywhere I can get it, and will pick integrated components where all else is equal. But I won't compromise best-of-breed to get integration. Looking at other parts of the system, here's how things have shaken out. - Radar: The jury is still out on this experiment. Simrad radar performance as I'm seeing it now is not acceptable, but we need to get to the bottom of whether this performance is the way it's designed or if we have a problem. Simrad are working on this as we speak. I'm also signed up for a week long radar operators certification course to be sure I'm not part of the problem. - Monitors: This experiment has been a total success. The 24" widescreen monitors are really nice for fitting lots of info and a single screen, and the easy-to-find-in-the-dark dimmer knobs are way more convenient that fumbling through on-screen menus using buttons that you can't see. Plus the full dim-to-dark avoids the need for screen filters. And I find the full 1000 Nit daylight visible brightness to be critical, even in a pilot house. All you need to appreciate this is to be running into a low sun, trying to see the on-screen info and what's ahead at the same time. Although they are pricey compared to desktop monitors, they are about 1/2 to 1/3 the cost of name-brand marine monitors. In this case, the risk really paid off. - VHFs: The experiment failed, but we recovered and have a very nice solution. I asked for Simrad VHFs, and it was a bad pick. The problems we encountered were 100% Simrad. We have switched back to Icom VHFs and they work great. I also wanted the VHFs on N2K and to be equipped with AIS receivers as backup to the AIS transceiver. This exposed some real immaturity in vendors' implementation of N2K, especially with respect to AIS. We ended up with non-AIS VHFs. - HS70 Sat Compass: The experiment has been a tentative success, pending the latest software update. This is a good unit, but has a hand full of nuisance issues. The good news is that the issues are all fixed in a new sw update. The bad news is that I can't get the update process to work so have sent it back to be updated by Simrad. I fully expect this will solve the outstanding issues. - Auto Pilot: This experiment has been a partial success. The autopilot works well, but even though Simrad told me in writing that dual auto pilot computers could be set up on the same N2K bus, switching between them via menu commands, that part doesn't work. And now they tell me - guess what - it doesn't work. Yup, figured that out. So we have the second computer pre-wired and ready to plug in if needed. And we added a switch to select between the two helm pumps. The redundant rudder indicators work fine, and you can select which one to use via the menus which is nice. - Simrad NSO vs Furuno NN3D vs Furuno TZ vs Garmin: This experiment has been a success looking at it in isolation, but it's ultimate fate is linked to the success or failure of the radar. I still like the NSO, and for every issue the NSO has I think there are 10 in the NN3D, and probably as many in the TZ. I used a TZ on a guy’s boat in Seattle and was reminded how much I dislike MaxSea which is at the heart of all the Furuno plotters. I continue to hear nothing but satisfaction from Garmin customers. But given my experience with Simrad radar so far, I would want to check very carefully how the Garmin radar compares relative to Furuno. And I still can't get past having Garmin as the sole source of charts when the plan is world wide cruising. It's that best-of-breed thing again. - Maretron monitoring: This experiment has been a success. This is mostly working very well, but there are a few glitches. I'm in the middle of a little dispute between Maretron and Simrad about allowable ways to handle multiple rudder indicators. But I think we are getting closer to solving that one. Aside from that the benefits are outstanding. 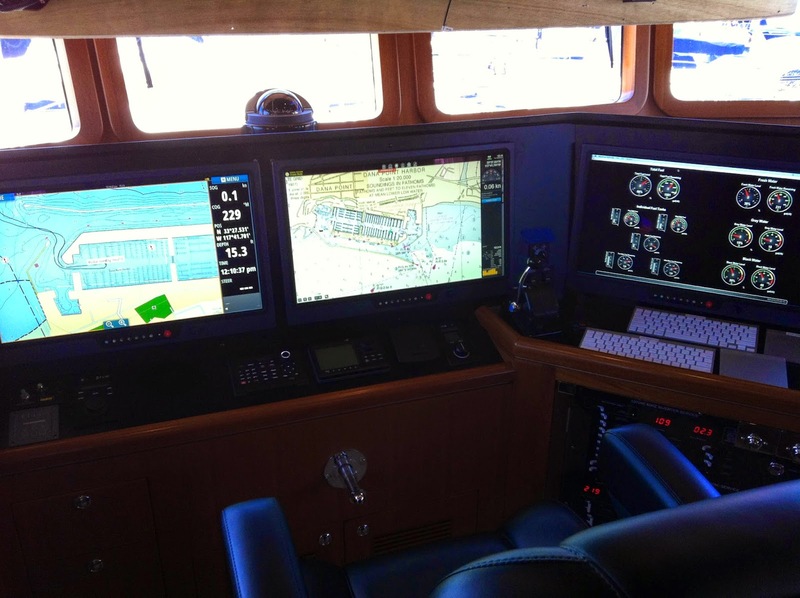 I've been able to set up a few different screens, each tailored to what the boat is doing. So, for example, there is an Underway screen and an Anchored screen. The Underway screen shows everything you need while you are underway, and it's all on one screen so there is no switching or scrolling around. 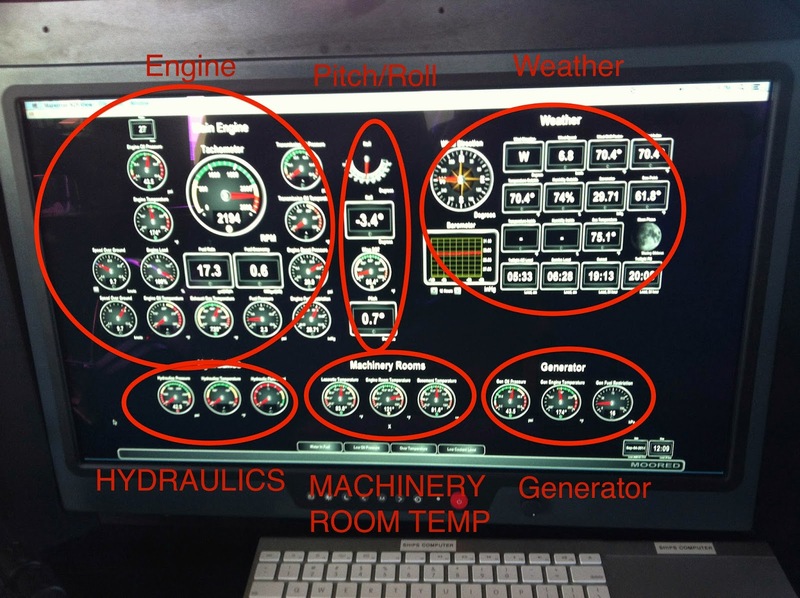 It includes all the engine vitals, hydraulics, fuel status, equipment room temperatures, weather conditions, and vessel performance like speed, roll, pitch, etc, and a bunch of alarms. And all gauges are red/yellow/green color coded so anyone can tell at a glance if things are within range without having to know, for example, what the hydraulic fluid temp range should be. The Anchored screen has a graphical anchor alarm that shows the boat and the allowed swing circle, and it alarms if you go outside the circle. It also shows weather info so you can see the wind speed and direction, etc. Plus, if the stabilization at rest is running, the hydraulics status is shown. Another hand screen I have just called "Instruments" and it shows the data coming from various instruments, mostly those where there are two of them. 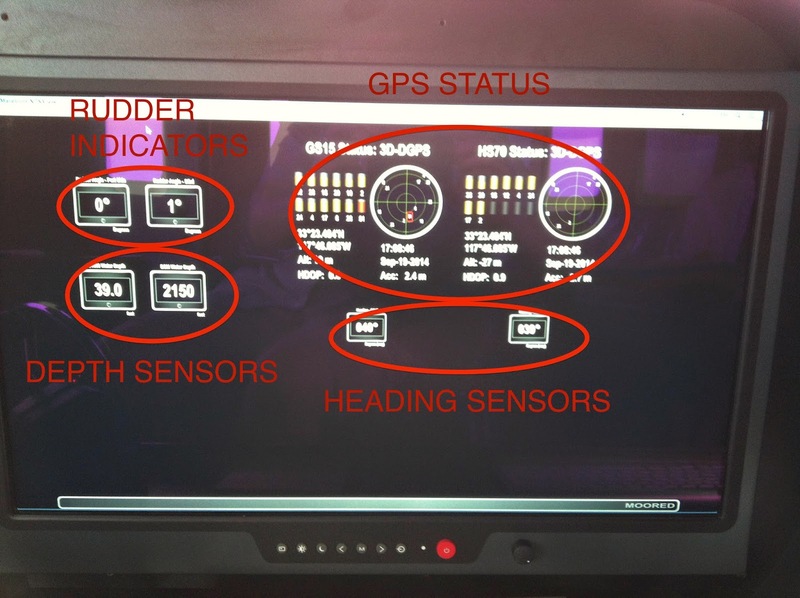 So I can see, side by side, the status and output from both the sat compass and the stand-alone GPS, the Sat compass and the rate compass, the two rudder indicators, the two depth sounders, etc. It's a real handy way to confirm that everything is working, especially the backup devices which are otherwise invisible until needed, and to confirm that redundant devices agree with each other. - Coastal Explorer: This has been a total success. I think CE has been the most trouble free device on my boat(s) for the past couple of years. I love it. - Mac Minis: These too have been a total success. One runs the Maretron monitoring, video camera monitoring, and is the boat's media server, all running natively under MacOS. The other runs MacOS too, but also VMWare Fusion +Windows 7 in order to run Coastal Explorer. It also hosts a hand full of utilities that I use from time to time that only run under Windows. But in general, it does only one thing and that's run CE. The minis are nice and compact as their name implies, have lots of USB ports and dual video ports, and consume very little power. The 12V conversion works really well too. These run for months at a time without even the slightest hiccup. I think that's most of it. At some later time I can talk about the entertainment system, on-board video library, ships' network, and the security system, but we'll save that for another day. Copyright (C) Peter Hayden. All rights reserved. Simple theme. Powered by Blogger.